1 Bedroom Ground Floor Flat For Sale in Cupar for Offers Over £80,000. 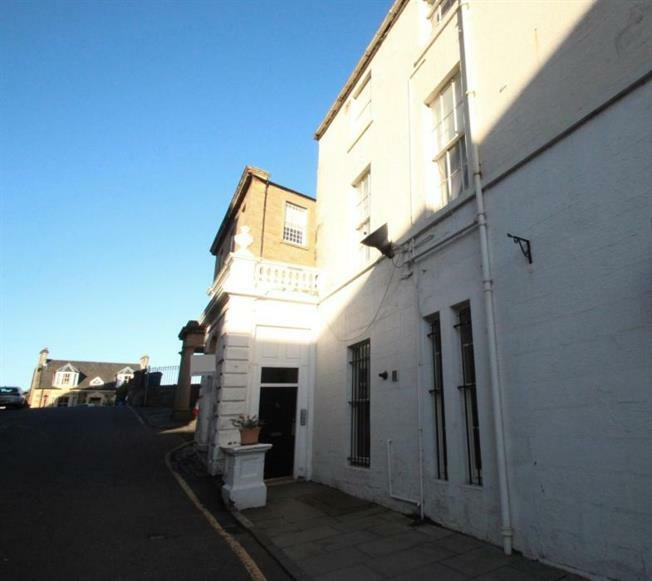 This generous sized, two storey apartment is located within Cupar town centre and occupies the ground floor and lower ground floor within a traditional building. The property is entered via a secure entrance door located on Castle Hill into a shared entrance reception hall and foyer. 10A is accessed from the foyer into a vestibule area providing access to the lounge dining room and kitchen on the ground floor. The lounge dining room benefits from a large window formation, shelved alcove with storage below and a feature fireplace. The kitchen is fitted with integrated electric hob, oven and extractor hood with sash & case window overlooking the court yard area. A door to the rear of the lounge dining room takes you to the staircase with storage cupboard on landing. The stairs lead to the lower ground floor where you will find a spacious double bedroom with fitted wardrobes and storage cupboard. The bathroom is fitted with a modern white suite with separate shower cabinet. There is also a door to a small private court yard area, a useful utility room with window overlooking the court yard, a further internal staircase returning to the foyer and a walk-in storage cupboard/box room. The property benefits from gas central heating.